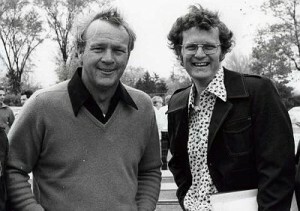 Arnold Palmer and I, after Palmer gave an exhibition at Rolling Green in Arlington Heights in 1969. It was back in the mid-1950s when my family lived on Chicago’s Northwest side. I was about 11 years old and my mother wanted me to see an exhibition event at Medinah. (Actually, I think she wanted to mainly see Arnold, the most charismatic athlete of our time). On the professional level, my best up close and personal experience with Palmer came in Boston. I was sent there to cover something else, but wanted to do a feature on Palmer in advance of the budding Senior PGA Tour (now called the Champions Tour) planning a Chicago visit. A few other writers from around the country had the same idea, and we gathered at a restaurant where Palmer was planning a private dinner with friends. Much more recently we visited Palmer’s Bay Hill Club in Orlando, FL, as part of golf/travel-writing adventures in 2015. Palmer was there, dining with his guests, getting his picture taken, just being Arnie. I have a treasured piece of golf art from that visit signed by the king himself. Palmer’s competitive career was winding down when I came on the golf-writing scene. He won his last PGA Tour event in 1973, but he kept playing – and that’s a big reason the golf kept growing and the Champions Tour became a viable part of the pro sports scene. In 49 years playing the PGA Tour Palmer earned $1,784,497 and won 62 tournaments including seven major titles. He earned much more than that in endorsements and other ventures, of course. His income from 2014, for instance, was reported at $42 million by one respected business publication. After winning the 1954 U.S. Amateur he served three years in the U.S.Coast Guard, a stint that interrupted but hardly stymied his plans to be a touring pro. Perhaps Palmer’s biggest victory came when he rallied from a seven-stroke deficit in the final round to win the 1960 U.S. Open, but he also blew a big lead on the back nine of another U.S. Open before losing to Billy Casper in a playoff in 1966. Palmer built the first golf course in China and designed more than 300 courses around the world. Among them are three in Illinois including Hawthorn Woods Country Club in the Chicago area. He has a drink in his name – an Arnold Palmer, iced tea and lemonade – that is known world-wide. He also had his own winery. He played in 50 Masters tournaments and was a major factor in the creation of The Golf Channel. He has both the Congressional Golf Medal and the Presidential Medal of Freedom – the only sports figure to have both.